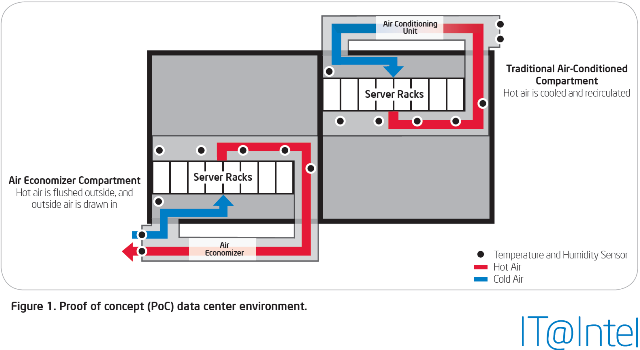 Intel set up 448 blade servers in each of two 500sqft rooms in a modular building space, totalling over 100kw of critical load per room. They used a commercial ducted DX packaged unit for cooling one of the spaces, and the same make and model cooling package using 100% outside air for the other space. The unit drawing 100% outside air was configured to start cooling if the intake air exceeded 90F. That's pretty warm even for high air flow servers. Server failure of the outside air room was almost double that of the closed loop room: 4.46% vs 2.45%. Intel didn't find the increased failure rate to be an issue but I'm sure their server vendors warranting the equipment would disagree.